A Frame with Davis is a chat show hosted by Steve Davis, but a chat show with a competitive element and a little bit of pro training. Each week, two celebrities match up to play a frame of snooker and this can see such heavyweight contests as Denis Waterman battling it out over the baize with Willie Carson or even Emlyn Hughes going toe to toe against Max Boyce. Now, these aren't furiously competitive games of snooker, in fact they're much like a game of snooker you might see taking place late at night in a pub. And that's because, remember, this is a chat show, so Steve Davis interjects between the potting to chat with the celebrities on offer. Often, he likes to a draw parallels between the world of snooker and the celebrities profession, so, for example, with Emlyn Hughes he discusses the amount of coaching involved in football compared to snooker and whether talent is an inherent quality. Sometimes, Davis simply concentrates on the celebrity's career such as questioning Denis Waterman on whether he prefers acting on stage or screen. Being a multiple world champion, Davis is well positioned to bring his expertise to the table and provides plenty of tips for the celebrities when they're in need of positioning advice or forming a solid bridge. Davis is particularly keen on stepping in if one of the celebrities is running away with the frame and, therefore, jeapordising the run time of the episode. All of this takes place in front of a studio audience - originally they're sat in traditional row seating, but later series see them at delightful, lamp lit tables. First airing in 1983, A Frame with Davis aired on Channel 4 and was an Anglia production in conjunction with Action Time. The 1983 series aired on Thursday evenings in the 11.20pm slot and the 1984 series was transmitted at 10pm on Saturday evenings. Eventually, the series moved to a more primetime slot with the 1985 series which aired at 6.30pm and went out on consecutive evenings over the Christmas and New Year period. The series was moderately successful with it sneaking into the top 10 viewed Channel 4 programmes with around 1.65 million viewers. The theme tune for A Frame with Davis was composed by guitarist Alan Parker who also worked on Minder, Dempsey and Makepeace and provided guitar for the Top of the Pops theme tune reboot of Whole Lotta Love. The initial concept for the series came from an idea developed and produced by Jeremy Fox who had previously produced The Krypton Factor and, demonstrating his passion for snooker, The Sports Quiz with Steve Davis. 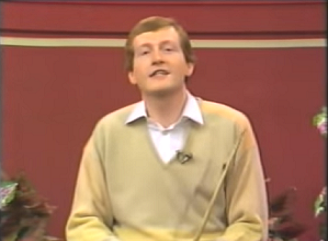 Someone on Twitter alerted me to the existence of a Steve Davis fronted chat show a while ago, but sadly YouTube was only able to throw up a couple of short clips. Better than nothing, of course, but not enough to get to the nub of this particularly curious matter. 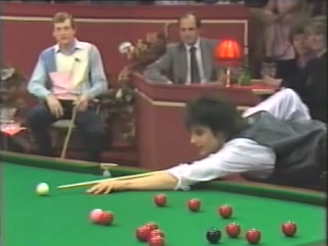 After all, we all know that Britain went snooker loopy (nuts are we) during the 1980s, but A Frame with Davis nary gets a mention aside from some references in 2016's The Rack Pack. And the clips on YouTube were rather beguiling as the concept is just so... unusual? Big Break - easily the most successful non-competition snooker snow - made sense and had a logical foundation to it, it was a quiz show with a little bit of comedy chucked in. But the idea of Steve 'interesting' Davis hosting a chat show as celebrities took to the table sounded like the scrapings of Alan Partridge's bottomless barrel of shocking TV pitches. And, naturally, this meant I had to seek out more of this curiosity, so I headed to the BFI to watch a few episodes. Fashion aside - and no one can be perfect at everything - the concept actually works very well. It's a highly informal show and the concept is far removed from more static chat shows (pretty much every single one I can think of was static). Davis' curious, yet engaging charm is welded to a precision guided sense of engagement which is fuelled by the laddish and laid back bonhomie of the guests. And the studio audience lap it up, getting involved either intentionally or when Max Boyce decides to grab their glasses for a better look at the table. Fouls are commited, but gleefully ignored whilst Davis and his guests cavort around the table in between sitting down for a quick chat on the intricacies of owning race horses or who Emlyn Hughes' favourite footballer was (Hughes also claims that no English team will dominate in the same manner Liverpool have, but this was, of course, about 9 months before Alex Ferguson headed to Manchester). And the guests aren't a rag tag of z-list celebs, they're all talented individuals who are integral parts of British culture, the leading benefit of which is that there's plenty to talk about. And Davis handles it all admirably. Sure, he's not a Michael Parkinson or a David Frost, but no one's expecting that - and I sincerely doubt that Parky or Frost were particularly confident around a snooker table even in their pomp. So, yeah, Davis can be a little bit rabbit in the headlights in the first series, but his natural curiosity for his guests gets the job done and his eyes really start to twinkle when he gets to impart his snooker expertise. And, in the later series, he's more assured which is admirable considering his sudden thrusting into the role of a TV presenter. 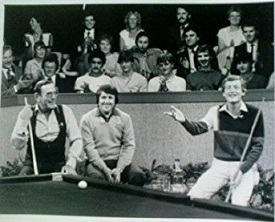 With a whole host of guests (including Mike Reid, Norman Wisdom, Bernie Winters and Suzanne Daniels), A Frame with Davis provides plenty of interest not just of a particular era, but also as a cultural snapshot when a sport, which is quintessentially British, became a national obsession and changed the lives of its stars beyond all recognition and, much like A Frame with Davis, is almost certainly unlikely to be repeated. So, let's try and dig up some complete episodes as they would make some perfect Sunday night viewing.